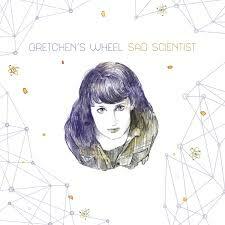 Album Review: Gretchen's Wheel, "Sad Scientist"
Lindsay Murray, who is the heart, mind and voice behind Gretchen’s Wheel, certainly knows how to craft and execute a damned fine pop song (okay, actually several). She also knows how to get a particular sound and the right people to help her get there – like Ken Stringfellow of The Posies and Big Star or Andy Reed of (our beloved) The Legal Matters, plus the talents of guitarist Fernando Perdomo. So she knows the right elements to help her songs come to life with a vibrancy, urgency and emotion that not many are able to do with this kind of ease (once you listen, you’ll understand what I’m talking about). This is now the third album released under the Gretchen’s Wheel moniker and as she did the last time, Ms. Lindsay has decided to handle the production as well as the writing/singing/performing duties. Fellow collaborator, the aforementioned Mr. Stringfellow, produced the first album, the atmospheric and lush Fragile State, but with last year’s Behind The Curtain, Ms. Murray added another hat to her collection. And with Sad Scientist, her talents as a producer almost take away from the fact that she’s also the performer. Crisp and bold; alive and colored with nuances, this album leaps right out at you from the start. From the opening riff of “Better In The Dark”, with its “liquid” guitar, segue from quiet to uptempo and boisterous on the chorus and the warmth of the lead vocals and backing voices, this is pure pop perfection; it’s the kind of track you devour. “Left Turn” has a “tougher” sound and a strident rhythm; it rocks hard and tight but maintains that pop sensibility of not going into unnecessary territory (i.e. indulgent guitar solos, etc. – the solo here is spot on); “Surviving” is a powerful, moving and highly personal piece and the lyrics speak volumes to me (“…you can’t decide on the right time to make an exit/when will you know when your best day is in the past…”) and “Save The Day” follows the theme of introspection with heartbreaking couplets like “…they say it goes faster the longer you live/I already watch my days run through a sieve…” – all this wrapped in a gentle and slightly haunting melody. “Blank Slate” would be (in a perfect world) the “leadoff single” – catchy, radio friendly, crunchy, a build-up on the bridge with classic backing vocals and a hooky chorus – like I said, this is how it’s supposed to be done and “Wish” is the closest “Nashville”-sounding piece on the album; a mildly countrified opening, but another perfect radio song. It’s easy: get/listen to Sad Scientist; let it get in your head and pick up on all the elements I was able to. Then go back and find/purchase Fragile State and Behind The Curtain. It’s clear that Lindsay Murray has mapped out quite a stunning triad of material. And with her latest offering, you can tell that I’m writing the truth – and that’s all you need to know.